There’s an opportunity to deal with the growing volumes of greenhouse gas emissions in B.C.—with increased tree planting and restoration of the province’s forests—but it may be a missed opportunity, going by forecasted tree planting in B.C. and a provincial government focused on fossil fuel development. The start-up of the sawmill in Big River, Saskatchewan—with its annual production target of 250 million board feet of lumber—is big news for the Carrier Group of Companies, and the community. Veteran Alberta logging contractor Herman Derksen—having survived the downturn and made some investments in new logging equipment—is thinking diversification is part of the path to maintaining a sustainable business. A new tong thrower developed by young logger Eric Krume is proving to be productive and portable—it is self-contained and can easily be moved from machine to machine. Logging equipment manufacturer Ponsse recently marked an impressive milestone, producing its 9,000th production machine, and the company continues to be known for its innovation. Just ask Quebec logging contractor Rejean Girard, who bought #9,000, an ElephantKing forwarder. 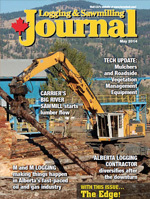 Included in The Edge, Canada’s leading publication on research in the forest industry, are stories from Canadian Wood Fibre Centre, Alberta Innovates - Bio Solutions, FPInnovations and Alberta Innovates-Technology Futures. 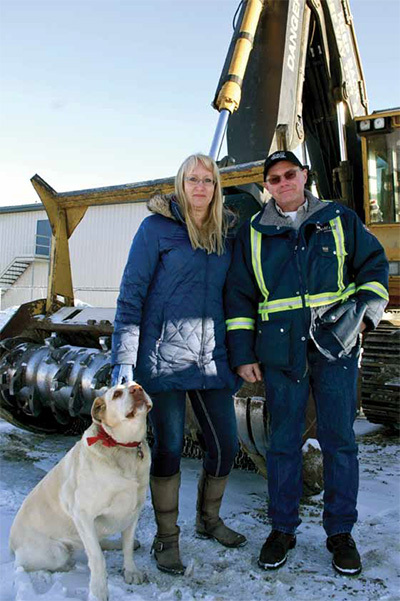 Mike and Lana Daniels, having exited from the forest industry a few years’ back, are now back, but this time around they are applying M and M Logging’s skills to “make things happen” in the fast-paced oil and gas industry in Alberta. Nova Scotia’s Walter Rodler is a true wood products innovator, and his work has resulted in improvements in production and safety for equipment from chainsaw mills through to wood splitters— and he’s still working away on new innovations. If the regulators can figure things out, loggers could be laying out cutblocks with the assistance of drones in the not-too-distant future, says Jim Stirling. After years working as logging contractors for the forest industry, Mike and Lana Daniels, along with their sidekick, Skidder, now market their wood management skills to the oilpatch. While Mike and Lana Daniels have retired from contract logging for the forest industry, they are now applying their skills in Alberta’s fast-paced oil and gas industry and are enjoying the new wood management challenges that this entirely different work environment brings. Based in Slave Lake, Alberta, the couple sold their logging fleet a few years ago, which put them in a good financial position. But being fairly young and still enjoying work life, the allure of applying their skills in new ways and working as masters of their own destiny was too much to pass up when it became clear that there were business opportunities in the oilpatch. So M and M Logging, which was established almost 30 years ago, came back to life. “Our goal is to be the wood guys, and no matter what your situation, we can accommodate you with harvesting and clearing,” says Mike. This includes mechanical harvesting and decking, particularly on oil lease roads and pad sites, and for log hauling, mulching, and horizontal grinding to make hog fuel. They also buy and sell sawdust, which is used primarily in the oilpatch for environmental remediation. In addition to contract wood management work in the oilpatch, they also bid on Fire Smart contracts offered by the Alberta government to mulch and thin potential fire fuel in forests surrounding communities like Slave Lake, which two years ago suffered the worst fire disaster in Alberta history when a wildfire destroyed over 300 homes. 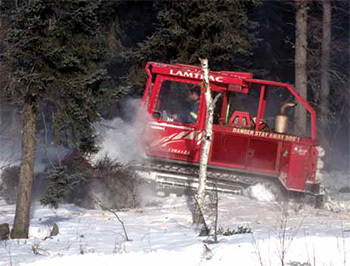 And because of the unique nature of their current equipment fleet, they will accept contracts with local forest companies for such tasks as using the company’s horizontal grinder to create hog fuel from waste fibre. To some extent, Mike Daniels is living the Alberta dream, having moved to the province from Nova Scotia in 1980 to operate a bulldozer for a family member. That put him in touch with the logging industry. When Slave Lake Pulp began advertising for logging contractors, Mike applied and was able to secure a contract, which started his career as a contract logger. He believes that his interest in mechanical harvesting and an aptitude related to all things mechanical helped him win the bid. Mike has written and passed the Alberta Journeyman Mechanic’s competency exam, and over the years has developed a number of innovations in his shop to improve mechanical equipment. 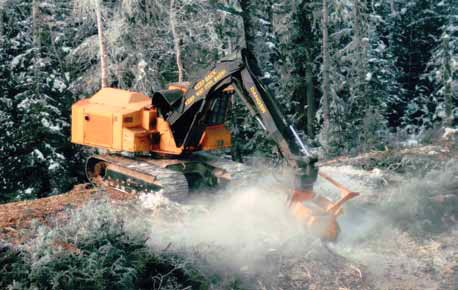 At the start of his logging career in 1987, Mike purchased a Bell Equipment three-wheel directional feller from a company in Savannah, Georgia, which he says was one of the first forays into mechanical harvesting seen in the Slave Lake area. This technology was developed in South Africa and was actually geared toward handling sugarcane. It was challenging to learn how to use the directional feller at first, but Mike says it was a successful experiment. It was the answer to a growing lack of hand fallers at that time. Eventually, M and M Logging developed into a fully mechanical, stump-to-dump logging contractor. But over time, the challenge of competing for labor with the area’s oil and gas industry just got to the point where it wasn’t fun logging for the forest industry any more. So when the opportunity to sell to another contractor presented itself in 2005, they accepted the offer and settled temporarily into retirement mode with a nest egg in the bank. Mike Daniels has modified three Lamtrac 6125 mulchers to the point where they can practically ‘walk on water’ for wood management on oilfield leases in muskeg. “But we were too young to retire,” says Lana, who works as partner, office manager, and dispatcher for M and M Logging’s current operations. Mike adds that although they were tired of the contract logging business, he still enjoyed the mechanical aspect of how logging equipment works. “He can’t sit still,” Lana says. They also had retained the Bell directional feller and a skidder, as well as a valued employee, Steve Holland, when they sold their logging fleet. 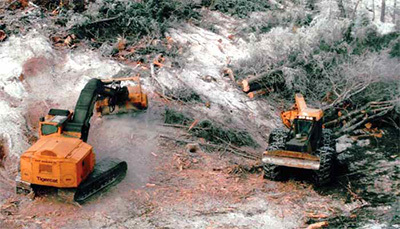 Mike says the types of opportunities presented by salvage logging for the oilpatch was a good fit for them because one of the biggest challenges to working as a logging contractor for the forest industry is boredom resulting from repetitive work. “So we decided to play around with it a little bit,” Mike says. Now, they’ve built back their company fleet to almost as large as when they sold out, but it is designed specifically for work in the oilpatch. They are able to work within the cramped confines of a road or pad site, and the equipment can be moved easily from site to site. “There is also some pipeline easement clearing work available and it’s hourly work—there’s no night time work involved, with a job typically lasting two to three weeks,” says Mike. Lana adds that once they got started in the oilpatch, they began to meet a lot of people with industry connections, which generated more business opportunities. They met many consultants who simply wanted trees salvaged from roads and pad sites by someone who knew what they were doing in advance of the arrival of a rig. The main philosophy that has served M and M Logging well with its transition to the oilpatch is its focus on service. “Our motto is, ‘we make it happen,’” says Lana. The company deals with all types of wood fibre from unmerchantable wood to sawlogs, which is one reason why their fleet is so diverse. They make it happen because like their initial purchase of the Bell three-wheel directional feller, M and M Logging will search for and purchase the right tool for the job, or as Mike calls it, the “weird stuff”. Alberta’s M and M Logging wants to be known as the ‘wood guys’ when it comes to fibre management on oilfield leases. But in addition to using their wood management equipment on oil leases, Mike Daniels also bids on Fire Smarting contracts with the Alberta government to keep the equipment busy. For example, their Morbark 3600 tracked, remote-controlled, horizontal grinder is something new for the Slave Lake area while there are thousands in use in the U.S. They also have two boom mulchers, having equipped these carriers with quick attach devices on their booms for conversion from harvesting to mulching. One is a Tigercat 726 wheeled feller buncher and the other is a Tigercat 860 tracked feller buncher. Their fleet also includes a Bombardier VR350 SnowCat for freezing access trails, a Tigercat 845 tracked feller buncher, a John Deere 748E skidder and a John Deere 748 GIII skidder, a John Deere 644 wheel loader and a Komatsu 250 wheel loader, a Supertrak 450MX mulcher, a John Deere 790 excavator, a John Deere 200 carrier with a Denharco DM4400 mono-boom delimber, a Caterpillar 320C log loader with a powerclam attachment, a Volvo skid steer and mulcher, four self-unloading chip vans, and a self-loading log truck. He will also modify brand new equipment so that it performs to his specifications. For example, Mike cut three new Lamtrac 6125 mulchers apart to widen the undercarriage and put wider pads on the units so that they can now practically ‘walk on water’. This has created a niche for the company because they can take these units into muskeg areas for pipeline easement prep work in the fall far earlier than anyone else. Mike also modifies equipment for multiple uses. One current project involves having the ability to mount a dangle head harvester on the Timbco forwarder so that one machine can both fall and skid trees on small jobs. The Daniels are excited about their new venture, but have already reached the point of having to decide just how big they want to get at this stage of their working lives. But that is a new chapter still to be written.